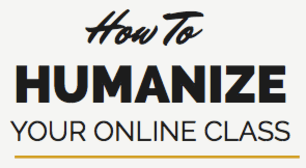 Free Class on Humanizing Your Online Course – Register Now! Are you interested in learning how to make your online courses more human? We have just the right course for you! Registration is now open for our popular “Humanizing Your Online Class” pedagogy course. The class is available for FREE to faculty and staff of Etudes colleges and $45 for non-members. It is offered fully online, through Etudes. The recommended professional development credit for the course is 6 hours. Successful participants will receive a certificate of completion.